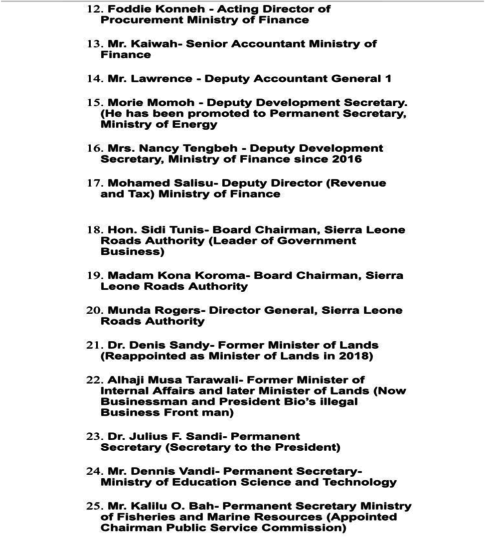 Some lists, containing names of very high profile personalities in the ruling Sierra Leone Peoples Party (SLPP) Government, whom according to the opposition, bear the greatest responsibility in terms of the financial management in the former APC Government of Dr. Ernest Bai Koroma have been leaked to Sierra Express Media. 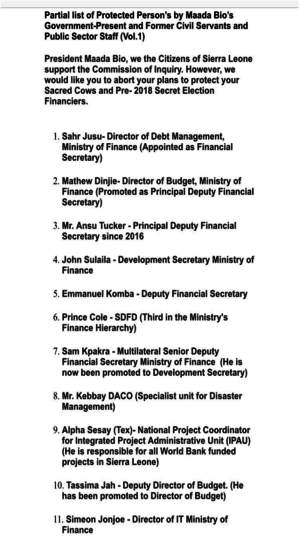 These lists, according to very competent and reliable sources from the corridors of power, are the names of persons who are allegedly under the protection of President Julius Maada Bio and who despite being alleged subjects of the Commissions of Inquiry, will not face the commissions. The names on these lists, our sources went on; include former Permanent Secretaries, senior accountants, procurement officials, and heads of MDA’s among others in the former APC Government and who are now key players in the “New Direction”. 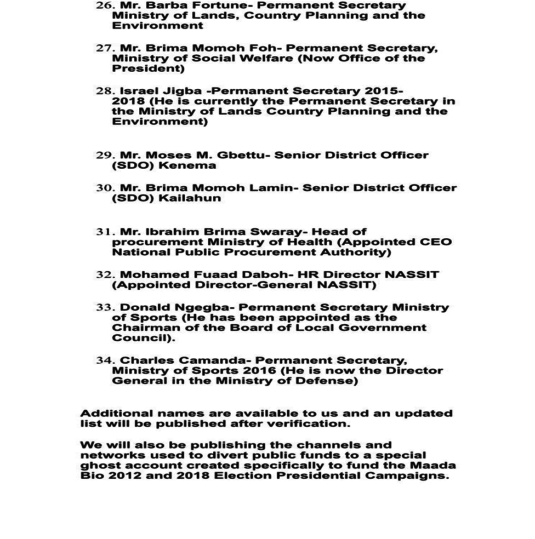 These persons, our sources furthered, are those who allegedly financed the 2012 and 2018 election campaigns of the current President, Julius Maada Bio and who are now been rewarded by the president as he protects them from facing any corruption investigation in the just launched Commissions of Inquiry. 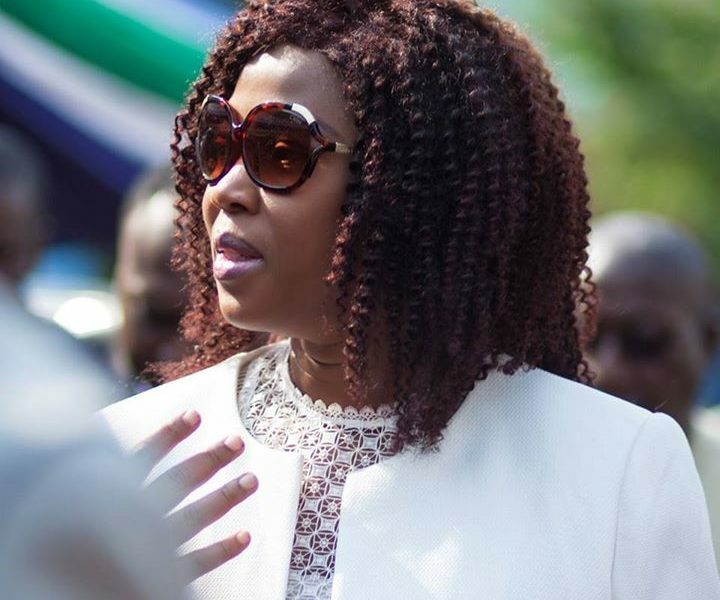 As the sun begins to shine in the night for the SLPP by bringing to light, it hidden evil plans, well-meaning Sierra Leoneans and even international bodies are beginning to lend credence to the claims made by the main opposition about the commission been a witch hunt tool that only target specific group in the country. How can the president protect those who bear the greatest responsibility in the management of the country’s finances for the past ten years? Concerned citizens and non-citizens queried adding that it will be a total selective justice should things remain the way they are. As at press time, efforts to get a govern representative to comment on the above allegation proved futile.